collectSPACE - resources and guides - "NASA Special Publications"
This article is the fifth in a series on NASA publications. Part One presented an overview of NASA Special Publications, emphasizing the General Publications (SP number <1000). Part Two provided an introduction to the Special Publications written under the auspices of the NASA History Office (SP-4000 series) and particularly on the category of Reference Works (SP-40XX). Part Three focused on the Management Histories (SP-41XX). Part Four continued with the first 11 of the NASA History Office Project Histories (SP-42XX series). This article concludes the review of NASA Project Histories. The older of these titles are often seen today in softcover, but they were also released in hardbound in very limited press runs. On Mars: Exploration of the Red Planet 1958-1978 (SP-4212) is a fine history of Mars probes during these years by Edward and Linda Ezell. The Mariner, Voyager, Viking Orbiter and Viking Lander programs are covered from both political and scientific perspectives to provide a cohesive view of Mars research rather than the more common narrow study of one program. The Ezells cover the controversy of the possibility life on Mars well and the book is illustrated with numerous B&W photographs. An early concern in the U.S. manned space program was the health and safety of its astronauts in an relative unknown -- the weightless environment of space. NASA physicians were extremely cautious about the risks and accordingly, biomedical research was important. In The Human Factor: Biomedicine in the Manned Space Program to 1980 (SP-4213), author John Pitts traces the efforts in this area beginning with Project Mercury through Apollo and Skylab. In doing so, he takes time to examine the "biopolitics" of manned space flight as well. Project Histories had previously included studies of the Saturn launch vehicle ("Stages to Saturn") and the Apollo Command and Lunar Modules ("Chariots for Apollo"). In 1989, NASA published William Compton's Where No Man Has Gone Before: A History of Lunar Exploration Missions (SP-4214). With a tip of the hat to Star Trek fans and a frontispiece illustration of Alan Bean's painting "The Hammer and Feather", Compton examines the realities of lunar exploration. Compton begins his study in 1957, inevitably overlapping with prior works but providing a strong presentation from the perspective of lunar exploration. He covers the debate over the handling lunar samples and the scientific goals of each of the flights. Appendices are dedicated to crew training, mission planning and simulations, with an essay on Apollo 13. Often overlooked among the series is First Among Equals: The Selection of NASA Space Science Experiments (SP-4215). In this fascinating volume, John Naugle describes the origins and early traditions of experiment selection. Beginning with the International Geophysical Year in 1957,ÊVanguard and the transition of NACA into NASA, as well as the founding of the Space Science Board, Naugle covers the tension between Homer Newell, Goddard and JPL, as well as the impact of NASA Administrator James Webb's leadership. More recently, under the lead of Roger Launius (Chief Historian of NASA, 1990-2002), the Project History series has expanded, including a volume devoted to the Boeing 737 Flying Laboratory (SP-4216) andÊBeyond the Ionosphere: Fifty Years of Satellite Communication (SP-4217). 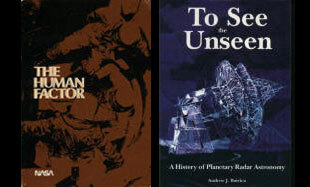 Andrew Butrica's To See the Unseen: A History of Planetary Radar Astronomy (SP-4218) is a significant, detailed work in this field, covering both the development of radar astronomy and the discoveries of Jodrell Bank among others. Pamela Mack served as editor of one of the most diverse Histories, From Engineering Science to Big Science: The NACA and NASA Collier Trophy Research Project Winners (SP-4219). The unassuming title hides a volume of 16 essays about such trophy-winning research projects as thermal de-icing, breaking the sound barrier, the X-15 hypersonic flight program, managing the US to the moon, Skylab, LANDSAT, Voyager, and the shuttle's first flight. A wonderfully insightful book. If you remember the opening of "The Six Million Dollar Man" TV series, you will also remember the crash of the M2-F2, covered extensively in R. Dale Reed's Wingless Flight: The Lifting Body Story (SP-4220) co-written with Darlene Lister. 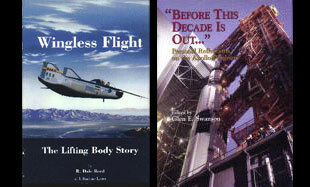 Reed is well qualified to write about the work conducted by the NASA Flight Research Center on eight lifting bodies at Edwards given his work at Dryden beginning in 1953. A personal story, Wingless Flight also includes enough technical data to appeal to an interested layperson or engineer. Noted historian T.A. Heppenheimer wrote The Space Shuttle Decision: NASA's Search for a Reusable Space Vehicle (SP-4221).Ê Heppenheimer begins with a look back at winged spacecraft, starting with the Collier's series in the early 1950s through the work of Sanger, the X-15, Dyna-Soar and on to long involved work of pitching a shuttle to the Nixon administration. The fun continues with J.D. Hunley's Toward Mach 2: The Douglas D-558 Program (SP-4222). Much of this fascinating volume is a symposium transcript with Richard Hallion, Robert Champine, and Scott Crossfield among others speaking on the D-558, but it also includes 48 previously confidential documents (mostly memos). Former Johnson Space Center historian Glen Swanson edited a compilation of oral interviews with notable NASA figures to give us Before this Decade is Out... Personal Reflections on the Apollo Program (SP-4223). This is an invaluable collection of statements from the likes of James Webb, Thomas Paine, Wernher von Braun, Robert Gilruth, Eugene Kranz, Glynn Lunney, Charles Duke, Harrison Schmitt, and Maxime Faget. A virtual feast for the Apollo enthusiast. Other volumes in the History Series examine the use of computers for digital fly by wire, NASA's Icing Research Tunnel and a history of the Deep Space Network. These are in addition to the half a dozen volumes in preparation for publication over the next two years. Part Six will cover the NASA Center Histories (SP-43XX) series. These are individual volumes dedicated to each of the NASA facilities located across the nation. Future resource guides on NASA Special Publications will include the other NASA History books, New Series in NASA History, NASA Educational Publications, Reference Publications and Conference Publications. Donald Boggs is the owner of Boggs SpaceBooks, an Internet based used bookstore carrying new and used books on the history of space exploration. He has a Ph.D. from Kent State University in the area of Communication. He has also produced and directed over 400 television programs many for broadcast around the world and has traveled to almost 50 countries. He has been enamored with the space program since, as a child of 8, he nervously watched Alan Shepard launch (not blast-off) into space.